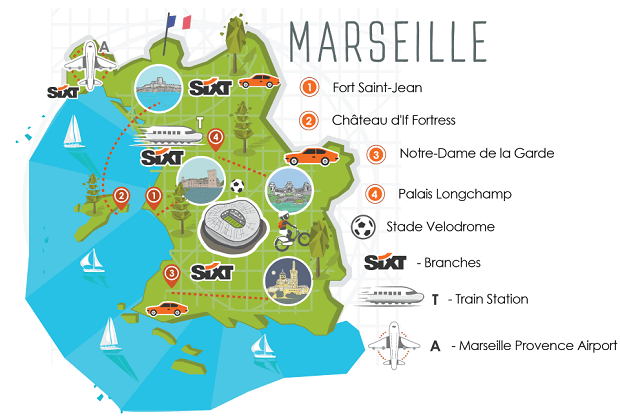 Enjoy hassle-free car hire from Marseille Airport with Sixt rent a car. We offer a comprehensive fleet of vehicles, including compact economy cars, family saloons, 4x4s, convertibles and luxury cars, so you can drive in the South of France in true style. Personalise your rental with our extras including sat nav and child car seats, and enjoy your rental without constraints with our long term hire, one way hire and additional driver options, giving you the freedom to discover the beautiful region of Provence and the wider South of France with absolute ease. We also run a 24 hour returns policy, so no matter your schedule, you don't have to worry about dropping your car rental back at Marseille airport. Our Marseille Airport car hire branch is conveniently located in front of the Arrivals Hall, in the 'Car Rental' area. Our friendly staff will be there waiting to assist you when you arrive. 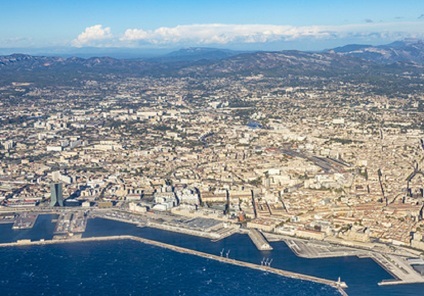 The airport is just 16 miles away from Marseille city centre, making it less than a half hours drive in your car rental. With less time having to be spent navigating local transport, you can get started with your trip as soon as you land. Marseille is a fascinating city with a unique heritage. As one of the oldest cities in Europe it has a complex history with many cultural influences from all over the world. These can be seen in its architecture and food, as well as in the traditional museums and galleries. The Vieux-Port is the old harbour and marina, protected by two large ancient forts, and offering European cafe culture by the sea with its many cafes and restaurants to sample local food. The Noailles district is one of the city's most diverse with many Arabic and Indo-Chinese shops, and the Noailles Market is a real treat, colourfully buzzing with life and history. The Corniche Road along the sea is a tranquil way to orientate yourself with views from the Chateau d'If, a small island off the city which a fort then turned prison, to Calanques, a series of small fjords outside the city with outstanding views. Pedestrian route from Halls 1-3-4-MP2. Visit the Sixt branch to collect your vehicle. The branch is located in the hire company car park in front of Hall 1, international terminal. MOTORWAY ACCESS A7, A8, A55, A51, A50. Go towards Aéroport Marseille-Provence/Marignane, then follow signs for "Parking location de voitures" (Hire Car Park). The Sixt branch is located in the hire company car park in front of Hall 1, international terminal. From Marseille city centre and Marseille St-Charles, Aix-en-Provence TGV or Vitrolles stations: buses to the airport run every 30 minutes. The Sixt branch is located in the hire company car park in front of Hall 1, international terminal. The key box is available on our cabin wall in the Sixt car park. For passengers arriving at Marseille Hall 1 (International), Halls 3-4 (national), MP2 (lowcost): Please go to the information outside the terminal building. Follow the signs for car rental at the airport, the Sixt branch is located opposite the international terminal Hall 1 in the third row on the left. Our staff will welcome you.